My friend Kathy and her husband John- and other family members that we don’t know so don’t get introduced into this story – own a million acres, 3 mountains, 1,000,000 cattle, 25,435 sheep, 234 ducks, 123 geese, 543 peacocks and 2 pigs. One pig is named piggy. We go and visit every spring to see the baby lambs and hold one. We decided to go today. They live about 20 miles outside of town. 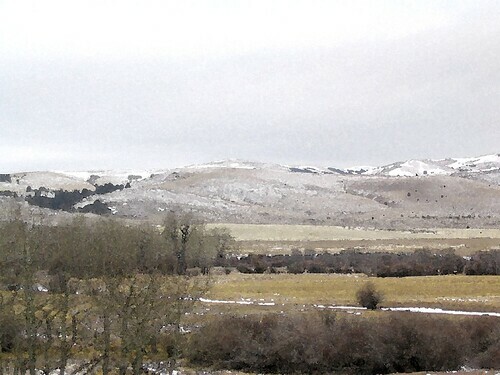 The farther north I drove, the more snow there is. I realized that my children were not dressed warm enough, but there are only so many clothes I’m ok with getting manure on. We get into the barn and see the baby lambs. I get one out and try to give it to katherine. She yells “NO. I want a clean one.” They have hay and dirt on them. They have manure on their feet. They were just birthed a couple hours/days ago. Give the lambs a break. Their hay is new. So finally Katherine decides a dirty one is ok; although she does find the cleanest one to hold and declare as her own. After she holds one and Seth holds one and we pet a few more and make sure their fingers don’t get near the mama’s teeth, we walk to the end of the barn to look at the hill that is covered with pregnant sheep. Every spring, the pregnant sheep are brought to this one fenced area. Once the sheep are in labor, they walk to the fence and lean against it and try to sit down. Then the tractor comes and once they start heavy labor, a hand reaches up and pulls the baby out. Then they are put onto the tractor and brought into the barn, placed with their baby or babies and left to bond. The afterbirth is generally still attached as they are being coerced to enter a pen. The baby lambs are slimy. Every year, I go and watch this and think how much it reminds me of the birth of my children. Luckily, this time, James was not there. Last year we actually watched a birth of twins up close and I had to explain why there was a “rope” connecting the mom and babies, what the red sack coming out now is, and why the baby is slimy. I believe there might have been a question about how all of this happens in the first place, but I may have blocked that out. This year, I just had Katherine and Seth and Katherine is still confused how our friend Dava is Barkley (her dog’s) mom and why I can’t have a puppy. But sights and questions as these are not the worse thing to see at the ranch. The worst thing to see at the ranch is your 2 year old son walking around in the hay and “dirt” holding one of his boots in his hands. He spent the ride home barefoot and is now bathing in lysol. Times like these renew my belief that getting close to nature can be overrated. Luckily we’ve never seen the neighbors’ lambs until they’re a few days old and clean. Trust me… I happen to be fairly knowledgeable on manure exposure. I have literally watched my children expose themselves in all kinds of manners and come out ok. I have had the very unfortunate experience of ingesting it (not willingly) and made it through. But I hope to never do it again! Your day sounded like fun!